A change agent is someone who is easily able to make changes in their lives and also the lives of others. They are often considered to be people of great influence and very likable. They seem like natural leaders. These desirable traits can be built and enhanced quickly in just a single step. That step is to learn and build a belief in yourself that you can easily change your own beliefs. Think about that for a moment. What bigger transition could you make than to fully believe that you can change anything? Wouldn’t that empower you to take on any challenge, overcome any obstacle and outperform any expectation? That is what a change agent needs to do and they need to be able to instill that in others as well to not only change themselves, but also those they interact with and teach. My last article, I talked about the foundation of beliefs and how using the power of emotions associated with pain and pleasure can have you steer your beliefs and build the ones you want. Well, that applied with practise and consistency will lead a person to believe that anything can be changed. That one belief is the driving force behind every great change agent. Only if you believe that something can be changed, can it. People with strong beliefs for changing things not only have the confidence in their own ability to change but also the ability to make change happen and to help change others. This confidence is visible from anyone interacting with them and it helps to brood more desire and willingness to change. This is what makes them successful, there is no room for failure if the belief is there and strong enough to make the change happen. Unfortunately, the world we live in forces us to see and hear negative discussions and disengaged people from both their work and lives every single day. People often float through life considering themselves to be victims without taking on any responsibility for what they have immediate control over. Well, that is a choice to live that way and its also a choice to not only change that, but also to become a change agent to move away from that shift. I know that if you are willing to change your own beliefs to have a bigger impact in the world without simply sliding through life dealing with what gets dishes your way, you are more likely to grow, learn, build your own beliefs, steer your own life and influence others. That kind of attitude is contagious and attractive, especially to those that are on the verge of a similar discovery but needing one more example or person to demonstrate that yes, it is possible. I encourage you to make yourself a change agent but working to show the things you have accomplished, the things that are difficult to change but you have learned to overcome and then to help others do the same in their lives. That can lead to making a big change in the world by living not just for yourself, but in a way that changes the lives of many! 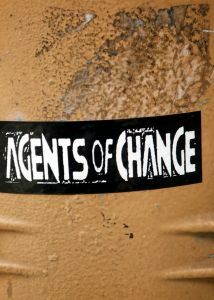 I sometimes wonder what it would be like if a majority of individuals were agents of change. The amount of added passion towards various subjects would be overwhelming. It is nice to see that increased connectivity is assisting in leading people closer to their region of interest. Thanks for the comment Armen, I plan to help develop more of those change agents! I’m curious where do you see this increased connectivity? Do you mean with blogging in general or something from my article? I wasn’t sure what you meant exactly with that part of your comment. Good day to you Mike. I was referring to increasing connectivity through mass-communication methods(on websites and using electronic devices), as more content is being linked with similar content daily. It could even be described as an overabundance of linkages. Right on Armen, thanks for clarifying and yes, you are right. The power being the network of the internet is massively undervalued when it comes to making change and driving change. If people build the networks and associates to drive the things they would otherwise struggle with on their own, that network enables nearly anything to be changed starting from just a single individual. That has never been as easy as it is today and blogging definitely shows me many signs of that! You have posted some great information in this page. I believe that the more change agents there are, the better this world can be.